To honour of the 40th Anniversary of the Gilbert & Sullivan Society of Waterloo Region, Drayton Entertainment is currently presenting that G&S favourite of 1879, The Pirates of Penzance. Pirates was part of Drayton Entertainment’s very first season in 1991 with Mustakas as the Pirate King. 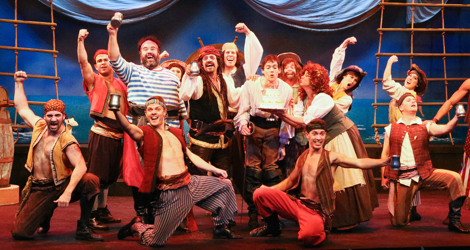 Now celebrating Drayton Entertainment’s 25th season Pirates is back with Mustakas reprising the same role. 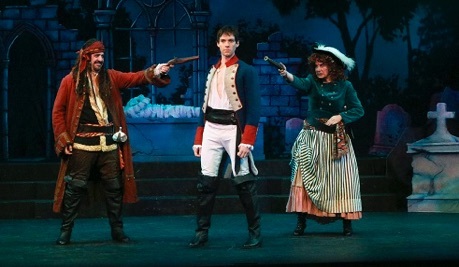 As director Mustakas adds in numerous references to other musicals, but he never allows them to overwhelm Sullivan’s music and he never alters Gilbert’s words and plot. The result is a delightful Pirates presented in a style that brings it close to the music hall of the period. In capturing the essentially satiric nature of the piece, Mustakas’ production is far more enjoyable than the Stratford Festival’s last two overproduced attempts at it in 2012 and in 1994. In 1994 Brian Macdonald had the strange idea of presenting the comic opera as if it were a silent movie swashbuckler being filmed by a maniacal director. In 2012 Ethan McSweeney’s steampunk Pirates was full of gimmicks that constantly distracted attention from the story. Mustakas’ production, despite the musical references, plays the operetta straight and is all the stronger for it. Set designer Jean-Claude Olivier uses old-fashioned painted flats which are perfect for creating the knowing wink to the theatre that accompanies every aspect of the show. Olivier’s one extravagance is to have the pirates arrive on a three-dimensional ship that sails in from the wings. Almost all the roles are well played in the familiar way. The not-very-good 1983 film version deviated from the norm by playing up the zaniness of the Pirate King to no particular point. Drayton’s present version deviates from the norm by playing up the peculiar character of Frederic which, in fact, makes much more sense of the operetta than any previous production I’ve seem. Frederic is “The Slave of Duty” of the operetta’s subtitle, but directors and actors usually grant him no personality other than the blandly sentimental nobility of other G&S tenor leads. Jamie McKnight’s Frederic is completely different. He makes Frederic speak and act like a very proper but slightly effete British schoolboy who is so innocent of the ways of the world that he seems rather dimwitted. This approach makes Frederic, for the first time ever, the most amusing character in the entire show and helps makes sense of puzzling aspects of the story that most directors gloss over. Yes, Frederick’s nursemaid Ruth (Rebecca Poff) may have apprenticed her charge to a pirate instead of a pilot because she was hard of hearing, but why has Frederic gone along with it for so long if he were not a bit dim and adhering to his oddly rigid “sense of duty” as his only guiding principle? Frederic’s naiveté also helps explain why he would ever agree to marry his own nursemaid, no matter whether she were as beautiful as she claims to be or not. The very precision of McKnight’s diction only makes Frederic’s speeches even more hilarious. Frederic’s blatant attempts to attract the Major General’s daughters to notice his person are just as funny. Continuing the character in music, McKnight sings with a sweet high voice associated more with teen idols rather than the full tenor he has used on other occasions. McKnight’s performance of Frederic is so persuasive and so funny it will be hard to se the role done any other way. As director, Mustakas adds references to other musicals in two ways. In the first and more subtle method, Mustakas will suddenly have a scene in Pirates flash-forward to a similar scene in a later musical. In her vocal showpiece “Poor wand’ring one”, Suzanne Rigden as Mabel interpolates some of the coloratura fireworks of Cunegonde’s “Glitter and be gay” from Leonard Bernstein’s Candide (1956) – one coloratura showcase thus anticipating the other. In a dance based on the tune of “Oh! better far to Live and die”, the music and the pirates’ moves suddenly turn into the Jets’ finger-snapping “Cool” dance from Bernstein’s West Side Story (1957) – one gang’s dance thus foreshadowing the other. Oddest of all, the Policemen’s music to “When a foeman bares his steel” suddenly morphs into “One” from A Chorus Line (1975), the Policemen using the brims of their hats and batons like the Chorus does its top hats and canes in the later show. One realizes that both numbers are driven forward by insistent rhythms of virtually the same pace. Mustakas second, more overt method comes into play in the second act when a long chase ensues, not unlike the conclusion of a panto, with the Policemen pursuing in Keystone Kops-like fashion the Pirates back and forth across the stage. All this activity seems to awaken characters in the wings from other musicals Drayton has presented. Jayme Armstrong reappears as Mary Poppins accompanied by two chimney sweeps. Dorothy and the Cowardly Lion race across the stage. Three female cast members compete in an egg-and-spoon race out of Anne of Green Gables. The Mother Abbess from The Sound of Music encourages the despairing Major-General (David Talbot) with “Climb Ev’ry Mountain”. A panto Snow White rushes past with Christopher Wilson as Nurse Tickle. Black-clad men raise Jayme Armstrong over their heads, now reprising her Roxie Hart from Chicago. The three little maids from school from The Mikado show up looking bewildered. And, best of all, Mustakas as the Pirate King appears transformed into Captain Hook pursued by a crocodile. This long chase scene, of course, is not in the original operetta, so a director is free to do with what he wishes. Not only do the characters from other musicals add to the general zaniness of the chase and theatrical satire of the original show, they serve as a kind of compressed history of Drayton Entertainment’s greatest hits which is appropriate for a show celebrating the company’s 25th season. Once the chase is over, the show turns back to the original script and its dénouement. Throughout the show, Mustakas encourages very precise diction in speech and song, an element essential to appreciating Gilbert’s clever dialogue and complex lyrics. As a performer Mustakas makes a fine Pirate King, though he does perhaps need the amplification more that some of the other performers. Suzanne Rigden, an opera singer making her Drayton debut, has a high, clear agile voice that clearly has no need of amplification. Besides bringing off Mabel’s highly-ornamented songs perfectly, Rigden also proves herself a fine comic actor. Rebecca Poff, another opera singer, was an ideal Ruth, frowzy-looking in an unkempt wig of curls with streaks of grey, yet singing with a strong controlled contralto and able to bring out Gilbert’s pitiful comedy of a proud woman having to confront her decline into middle-age. David Talbot is a reliable Major-General Stanley, who has no trouble with the famous tongue-twisting patter song “I am the very model of a modern Major-General” but who does rely on amplification to be heard. Eddie Glen is a genial, always-dancing Sergeant of Police, with Jayme Armstrong and Mairi Babb doing fine work as the Major-General’s giggly daughters Edith and Kate with Nick Settimi imposing as the Pirate King’s right-hand man Samuel. If there is a problem with the production it has to do with the sound. First, the keyboards played by music director Steve Thomas nearly blot out the sounds of the other seven musicians in the orchestra. Second, in the performance I attended, the balance between the orchestra and the singers was off for Act 1 with the orchestra too loud for the singers. This was rectified by Act 2. Third, the mics for Eddie Glen and David Talbot were not turned up high enough so that the words from their two famous entrance songs went missing, a point Glen mentioned in an ad lib in Act 2. G&S really should not have to be amplified in such a small theatre as the St. Jacobs Country Playhouse but if it must be done it should be done well. This objection to the technical side of things aside, Drayton Entertainment’s new Pirates is a highly enjoyable show that celebrates not only G&S in the Waterloo region but Drayton’s own history. In the past thirty years directors have tried all sorts of ways to update G&S, usually to the detriment of the wit of Gilbert’s words and Sullivan’s music. Mustakas’ direction shows he knows just how much new material he can add without damaging the structure and story of the original work. Because of this, let’s hope Drayton explores more G&S in the future. 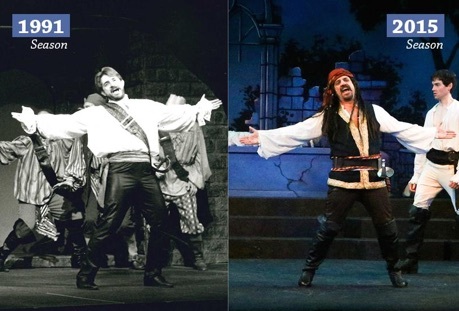 Photos: (from top) The Pirates in The Pirates of Penzance; Alex Mustakas as the Pirate King, Jamie McKnight as Frederic and Rebecca Poff as Ruth; Alex Mustakas as the Pirate King in 1991 and in 2015 (with Jamie McKnight). ©2015 Drayton Entertainment.